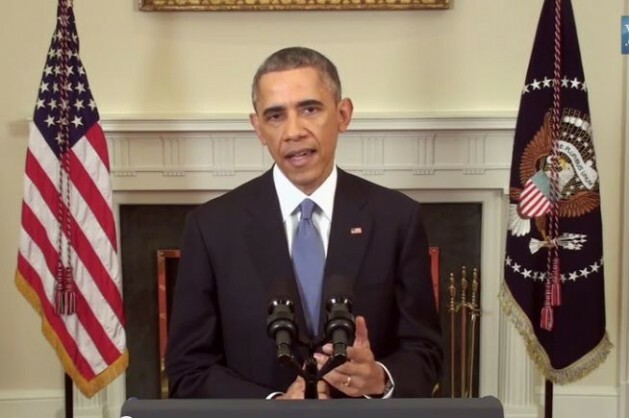 Obama speaks on video about changes in Washington's Cuba policy. WASHINGTON, Dec 18 2014 (IPS) - In perhaps his boldest foreign-policy move during his presidency, Barack Obama Wednesday announced that he intends to establish full diplomatic relations with Cuba. While the president noted that he lacked the authority to lift the 54-year-old trade embargo against Havana, he issued directives that will permit more U.S. citizens to travel there and third-country subsidiaries of U.S. companies to engage in commerce, among other measures, including launching a review of whether Havana should remain on the U.S. list of “state sponsors of terrorism”. “In the most significant changes in our policy in more than 50 years, we will end an outdated approach that, for decades, has failed to advance our interests, and instead we will begin to normalise relations between our two countries,” he said in a nationally televised announcement. The announcement, which was preceded by a secret, 45-minute telephone conversation Tuesday morning between Obama and Cuban President Raul Castro, drew both praise from those who have long argued that Washington’s pursuit of Cuba’s isolation has been a total failure and bitter denunciations from right-wing Republicans. “Today’s announcement initiating a dramatic change in U.S. policy is just the latest in a long line of failed attempts by President Obama to appease rogue regimes at all costs,” said Florida Sen. Marco Rubio, one of a number of fiercely anti-Castro Cuban-American lawmakers and a likely candidate for the Republican presidential nomination in 2016. “I intend to use my role as incoming chairman of the Senate Foreign Relations Committee’s Western Hemisphere subcommittee to make every effort to block this dangerous and desperate attempt by the President to burnish his legacy at the Cuba people’s expense,” he said in a statement. The outgoing Democratic chair of the Foreign Relations Committee, New Jersey Sen. Robert Menendez, also decried Obama’s announcement. “The United States has just thrown the Cuban regime an economic lifeline. With the collapse of the Venezuelan economy, Cuba is losing its main benefactor, but will now receive the support of the United States, the greatest democracy in the world,” said Menendez, who is also Cuban American. But other lawmakers hailed the announcement. “Today President Obama and President Raul Castro made history,” said Sen. Patrick Leahy, a senior Democrat and one of three lawmakers, including a Republican Sen. Jeff Flake, who escorted a U.S. Agency for International Development (USAID) contractor, Alan Gross, from Havana Wednesday morning as part of a larger prisoner and spy swap that precipitated the announcement. Part of that deal included the release of 53 prisoners in Cuba, including Gross, who the U.S. considers to be political prisoners. Other analysts also lauded Obama’s Wednesday’s developments, comparing them to historic breakthroughs with major foreign-policy consequences. “Obama has chosen to change the entire framework of the relationship, as [former President Richard] Nixon did when he travelled to China,” said William LeoGrande, a veteran Cuba scholar at American University, in an email from Havana. Michael Shifter, president of the Inter-American Dialogue, a Washington-based hemispheric think tank that has long urged Washington to normalise ties with Havana, told IPS the regional implications would likely be very positive. “Obama’s decision will be cheered and applauded throughout Latin America. The Cuba issue has sharply divided Washington from the rest of the hemsiphere for decades, and this move, long overdue, goes a long way towards removing a major source of irritation in US-Latin American relations,” Shifter said. Indeed, Obama also announced Wednesday that he will attend the 2015 Summit of the Americas in Panama in April. Because Castro was officially invited, over the objections of both the U.S. and Canada, at the last Summit in Cartagena in 2012, there had been some speculation that Obama might boycott the proceedings. Harvard international relations expert Stephen Walt said he hoped that Wednesday’s announcement portends additional bold moves by Obama on the world stage in his last two years as president despite the control of both houses of Congress by Republicans, like Rubio, who have opposed Obama’s efforts to reach out to perceived adversaries. “One may hope that this decision will be followed by renewed efforts to restore full diplomatic relations with even more important countries, most notably Iran,” he told IPS in an email. Administration officials told reporters that Wednesday’s developments were made possible by 18 months of secret talks between senior official from both sides – not unlike those carried out in Oman between the U.S. and Iran prior to their November 2013 agreement with five other world powers on Tehran’s nuclear programme — hosted primarily by Canada and the Vatican, although the Interests Sections of both countries were also involved. Officials credited Pope Francis, an Argentine, with a key role in prodding both parties toward an accord. “The Holy Father wishes to express his warm congratulations for the historic decision taken by the Governments of the United States of America and Cuba to establish diplomatic relations, with the aim of overcoming, in the interest of the citizens of both countries, the difficulties which have marked their recent history,” the Vatican said in a statement Wednesday. The Vatican’s strong endorsement could mute some of the Republican and Cuban-American criticism of normalisation and make it more difficult for Rubio and his colleagues to prevent the establishment of an embassy and appointment of an ambassador, according to some Capitol Hill staff. Similarly, major U.S. corporations, some of whom, particularly in the agribusiness and consumer-goods sectors, have seen major market potential in Cuba, are likely to lobby their allies on the Republican side. “We deeply believe that an open dialogue and commercial exchange between the U.S. and Cuban private sectors will bring shared benefits, and the steps announced today will go a long way in allowing opportunities for free enterprise to flourish,” said Thomas Donohue, the president of the U.S. Chamber of Commerce in a statement. Donohue headed what he called an unprecedented “exploratory” trip to Cuba earlier this year. Wednesday’s announcement came in the wake of an extraordinary series of editorials by the New York Times through this autumn in favour of normalisation and the lifting of the trade embargo. That stance, of course, could alienate some Cuban-American opinion, especially in the critical “swing state” of Florida if Clinton runs in the 2016 election. But recent polls of Cuban Americans have suggested an important generational change in attitudes toward Cuba and normalisation within the Cuban-American community, with the younger generation favouring broader ties with their homeland.